Regardless of the size of your home, it is always ideal to maximize the current space that you do have, opening it up and allowing it to feel more spacious. This becomes ever-important in small spaces, and there are a variety of ways in which to achieve this, which are listed below. Front hallway: Open it Up. Add a small bench or shoe cabinet into your entryway to get shoes off of the floor, which create additional clutter in your home. Shoe hooks are an even better option. Install wall mounted hooks for jackets and backpacks, items which are typically left at the front door. Add a second rod into your closet to get double the amount of space. Use a shelf cubby, which hangs from the rod, to store seasonal clothing. Consider also adding a mirror into the front hallway to create the illusion of space. Install vertical shelves both in the kitchen itself (displaying dishes, jars of legumes or spices, for example) and in the pantry as well. Hang up pots and pans on the wall to free up additional space elsewhere. Make use of drawer organizers to make the most of each space, as well as food storage containers. Consider removing your kitchen table and replacing it with bar stools and downsizing your refrigerator. Make use of the inside of cupboard doors by hanging things like kitchen utensils. Shelving, like above the toilet, can house towels and other bathroom essentials. Install a hook on the back of the door and add a basket, filling it with heat tools. Maximize space under the sink by using baskets. Get a shower caddy to store soaps and shampoos so they don’t take up excess space in your bathroom cabinets. Go with small and slimmed down furniture instead of oversized couches. Remove your TV stand and consider mounting the television onto the wall. Consider adding an ottoman into your room, which can provide additional space for video games, etc. Find a coffee table that has drawers or shelving below and invest in side tables that have storage. Consider replacing your bookshelf for shelves that hang on the wall. Ensure that you are utilizing all of your closet space by investing in closet organizers. Free up additional closet space by storing out-of-season clothing under the bed (and anything else that will fit under there). The Office: Organization is Key. Maximize space in the office with desk organizers. Get a portable storage drive for all of your digital documents, freeing up desk space. Alternatively, a wall file system also works well. 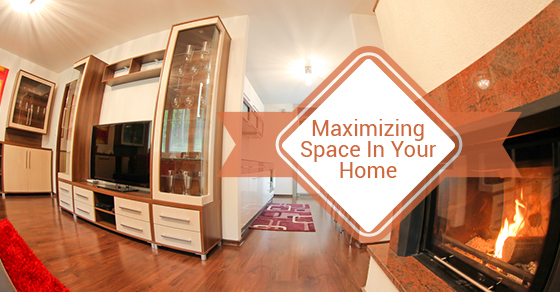 Addressing each room of your home one at a time will make the task of maximizing space much more manageable. With these tips, you will not have any trouble finding space, regardless of the size of your home.